Dimner Beeber Middle School is a historic middle school located in the Wynnefield neighborhood of Philadelphia, Pennsylvania. 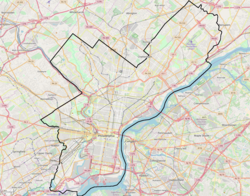 It is part of the School District of Philadelphia. The building was designed by Irwin T. Catharine and built in 1931–1932. It is a three-story, 15 bay, brick building on a stone basement in the Classical Revival-style. It features a projecting center section and projecting end bays, projecting brick pilasters with stone bases and caps, moulded cornice, and balustraded parapet. Since 2013, the building has been shared with the Science Leadership Academy at Beeber, the second branch of the Science Leadership Academy. The high school focuses on science and technology. 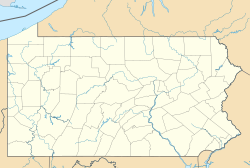 ^ "National Historic Landmarks & National Register of Historic Places in Pennsylvania" (Searchable database). CRGIS: Cultural Resources Geographic Information System. Note: This includes Jefferson M. Moak (May 1987). "Pennsylvania Historic Resource Survey Form: Dimner Beeber Junior High School" (PDF). Retrieved 2012-07-03. ^ "Science Leadership Academy @ Beeber". Philadelphia Public School Notebook. Retrieved March 21, 2017. This page was last edited on 22 March 2017, at 05:49 (UTC).